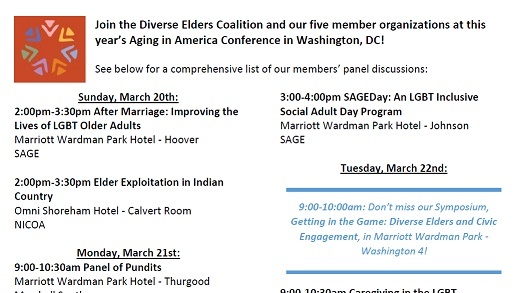 The Diverse Elders Coalition and all five of our coalition members will be in attendance at the 2016 Aging in America Conference, March 20th through the 24th in Washington, DC. This is one of our favorite annual events, not only because it is one of the biggest in the nation, bringing together policy experts, advocates, and elders to discuss the state of aging research and policy, but also because it’s one of the few opportunities for all of the DEC staff – who are spread across the United States – to be in the same room. As a coalition, we value these connections with our communities – including the members of our own organizations! – and look forward to opportunities to take our work out of email and conference calls and onto the ground. If you’re attending ASA this year, we’d love to see you at the panels and workshops at which our members will be presenting. We’ve put together a PDF document detailing all of our groups’ appearances throughout the conference, which you can view and download here. Our coalition staff will be presenting on a variety of topics, from elder abuse to employment and economic security to caregiving. We hope you’ll mark your calendars for these panels and come say hi to us! The Diverse Elders Coalition will be hosting two events at ASA: Getting in the Game, a coalition-wide symposium on civic engagement and diverse elders, and Providing Culturally Competent Services to Diverse Elders, a panel discussion about the unique needs of our elders of color, American Indian/Alaska Native elders, and LGBT elders. We’re really excited for the opportunity to bring the voices of our communities to mainstream aging programming. Additionally, during the weeks leading up to the conference, we’ll be featuring blog posts from coalition members and friends about their participation at ASA and the work they’re doing outside of conference halls. Be sure to bookmark the ASA 2016 tag on our blog, or follow us on Facebook and Twitter, for the latest conference news. And if you haven’t yet registered for ASA 2016, there’s still time to do so, and discounts are available.